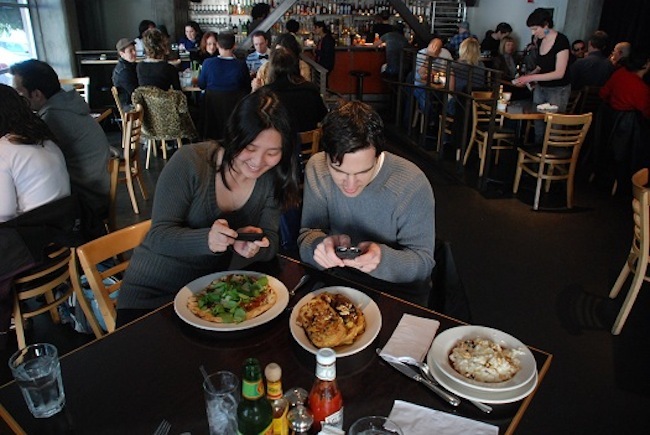 Silicon Valley Uncovered: Foodspotting celebrates 1 year and $3 million, but why is the Android app still in beta? Foodspotting, the app allowing you to share pictures and locations of your favorite food, had its one year-old birthday party last night. The company, which recently announced $3 million in funding from BlueRun ventures, is popular not only amongst early adopters, but has 550,00 iPhone users worldwide and over 289,539 foods shared to date. I sat down with the cofounders Alexa Andrzejewski (Adaptive Path), Ted Grubb (Get Satisfaction) and Soraya Darabi (New York Times) and asked them how people sharing their favorite foods will amount to generating revenue. Alexa’s answer was that they are concentrating on making the product the best it can possibly be before thinking too much about revenue, but much like Foursquare and Gowalla the business model comes down to partnerships with food vendors and location deals. Afterwards I asked some party revelers what they thought of the app, most loved it and were avid users, but some (like the couple at the end of the video) found the Android app (still in Beta) difficult to install. A year on and Android app still in beta? Why?